Santa Cruz is the largest of Bolivia's nine departments (states) and covers most of the Eastern half of the country. 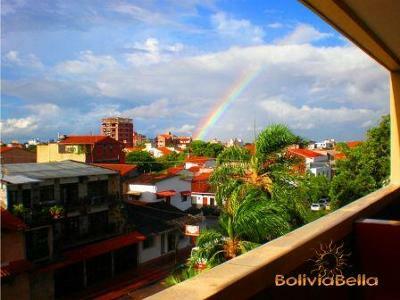 Santa Cruz de la Sierra, its capital city, is currently the largest and fastest growing city in Bolivia. At 416 meters above sea level, it is warm and tropical most of the year, except for a 2-3 month winter period (June - August, also the dry season) when the average temperature is 55ºF (13ºC). Be aware, however, that it can get very cold very suddenly. "Surazos" (southerly winds that blow in from Argentina) can drop the temperature by as much as 30 degrees overnight. During the summer (December - March, also the rainy season) the average temperature is 80ºF (27ºC). Normally, it rains for short periods during the day, sometimes with sun; therefore, rainbows are not uncommon. However, during years when the El Niño ocean current affects the climate, it can rain for several days covering the skies in heavy grey clouds. Because it is warm, the weather can be very humid during these months. Throughout the rest of the year the climate is sunny and hot, with warm, moist breezy evenings and cool dawn hours. Protecting your skin with sun block is recommended. Return to our Climate Home Page for more details about the seasons, weather and climate in Cobija and Pando Bolivia.